HOUSTON — (October 14, 2015) — After a relatively flat performance in August, the Houston housing market kept pace with last year's record sales volume and prices throughout September. Just as in August, homes priced between $150,000 and $500,000 saw moderate gains, while the low and high ends of the market declined. According to the latest monthly report prepared by the Houston Association of Realtors (HAR), September single-family home sales totaled 6,691 units compared to 6,463 a year earlier, an increase of 3.5 percent. It took 49 days for the average home to sell versus 48 days in 2014. Months of inventory, the estimated time it would take to deplete the current active housing inventory based on sales over the previous 12 months, grew from a 2.9-months supply last September to a 3.5-months supply. Inventory has held at a 3.5-months supply for the past three months, but remains below the current national housing supply of 5.2 months of inventory. Home prices reached September highs, with the average price of a single-family home up 0.5 percent year-over-year to $270,901. The median pricethe figure at which half the homes sold for more and half for lessjumped 4.5 percent to $208,000. Sales of all property types totaled 8,024 units, up 2.2 percent compared to September of last year. Total dollar volume rose 3.8 percent to $2.1 billion. "September showed a bit more vitality than August, and considering that we are comparing to a record 2014 sales year and remain in a climate of energy-related layoffs, I'd say that the Houston real estate market is truly holding its own," said HAR Chair Nancy Furst with Berkshire Hathaway HomeServices Anderson Properties. "Sales inventory has been stable for the past three months and we expect it to grow in the last quarter of 2015." The Houston housing market saw across-the-board gains in the September 2015 versus 2014 analysis, with single-family home sales, total property sales and total dollar volume all up, while prices reached record highs for a September. Month-end pending sales for single-family homes totaled 6,602, a 3.7 percent decline from a year earlier, which might suggest slower sales when the October numbers are tallied. Active listings, or the number of available properties, at the end of September rose 17.6 percent to 34,041. Houstons housing inventory has held at a 3.5-months supply since July of this year, but is up from the 2.9-months supply recorded in September 2014. That still remains below the current 5.2-months national supply of homes reported by the National Association of Realtors (NAR). ** Effective May 2015, in an effort to be consistent with industry standards, the Houston MLS is now including all categories of pending sales in its reporting. Previously, the Houston MLS did not include option pending and pending continue to show listings in its reporting of pending sales. The new methodology is now all-inclusive for listings that went under contract during the month. Single-family home sales totaled 6,691 in September, up 3.5 percent from September 2014. Home prices reached the highest levels ever for a September in Houston. 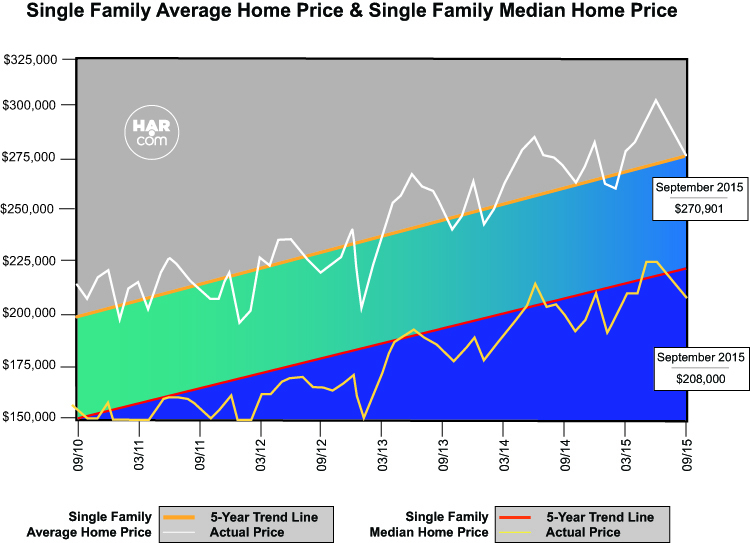 The single-family average price rose 0.5 percent from last year to $270,901 and the median price jumped 4.5 percent year-over-year to $208,000. The average number of days it took to sell a home, or Days on Market (DOM), was 49 in September versus 48 days a year earlier. Single-family home sales tracked on a year-to-date basis were flat in September at 57,302. 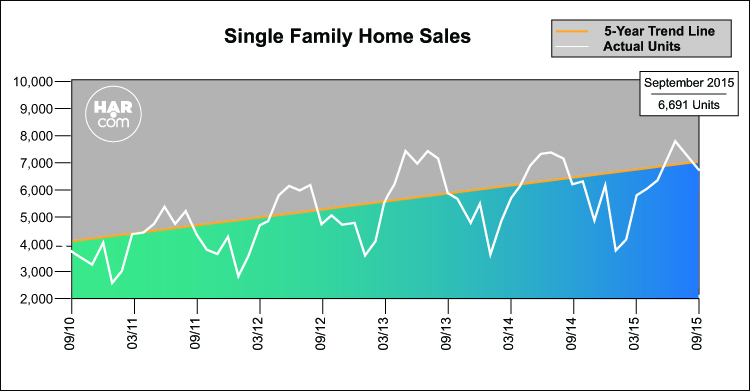 HAR also breaks out the sales figures for existing single-family homes. Existing home sales totaled 5,726 in September, up 2.7 percent versus the same month last year. The average sales price was unchanged year-over-year at $250,404 while the median sales price rose 5.2 percent to $192,000. Sales of townhouses and condominiums fell 4.5 percent in September. A total of 599 units sold compared to 627 properties in September 2014. The average price, however, rose 4.5 percent to $207,119 and the median price edged up 1.3 percent to $155,000. Inventory grew from a 2.5-months supply to 3.2 months. Demand for single-family lease homes and townhomes/condominiums were flat in September. The average rent for single-family homes rose 2.3 percent to $1,792, while the average rent for townhomes/condominiums was unchanged at $1,533. Single-family homes months of inventory climbed to a 3.5-months supply versus 2.9 months a year earlier. The computerized Multiple Listing Service of the Houston Association of REALTORS® includes residential properties and new homes listed by 31,000 REALTORS® throughout Harris, Fort Bend and Montgomery counties, as well as parts of Brazoria, Galveston, Waller and Wharton counties. Residential home sales statistics as well as listing information for more than 50,000 properties may be found on the Internet at https://www.har.com. Founded in 1918, the Houston Association of REALTORS® (HAR) is a 31,000-member organization of real estate professionals engaged in every aspect of the industry, including residential and commercial sales and leasing, appraisal, property management and counseling. It is the largest individual dues-paying membership trade association in Houston as well as the second largest local association/board of REALTORS® in the United States.